After experiencing several failed relationships in his life, Vincent van Gogh truly believed that a man’s most important relationship was with nature. 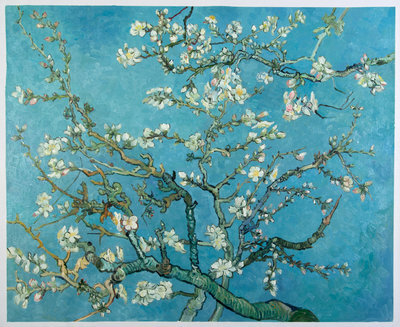 In an effort to build this relationship, Van Gogh painted many nature-inspired paintings and the Blossoms series was just one of them. 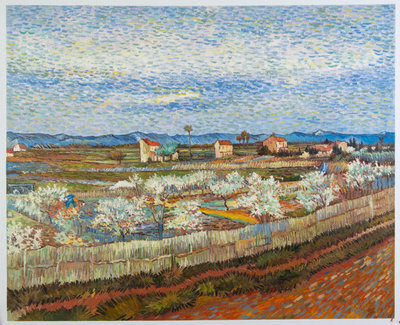 In this series, Van Gogh included orchards, peach trees, and almonds, all blossoming as the spring season reached its peak. 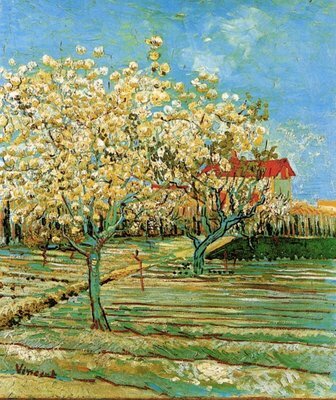 Blossoming Almond Tree, Orchard in Blossom, La Crau with Peach Trees in Blossom and Orchard in Blossom with View of Arles, are some of the most prominent paintings from this series. 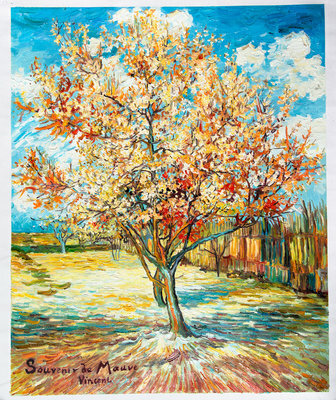 Blossoming Almond Tree is a masterpiece by Van Gogh, mainly because it is such a departure from his normal strokes, hues, and colour palette. The influence of Japanese art is also very obvious in this painting. In a letter from his brother Theo, Van Gogh learned that Theo and his wife had just had a son, who they named after Vincent himself. In celebration of new life and his new nephew, Van Gogh decided to work on a new painting. 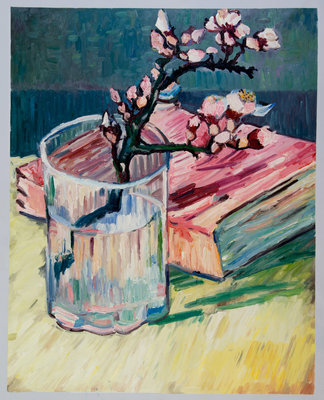 The Blossoming Almond Tree in this painting symbolizes the birth of a new life, and that is why this painting has such a freshness to it. It's impressive to see that even though Van Gogh was dealing with depression, a sudden good news made him paint in a different way. 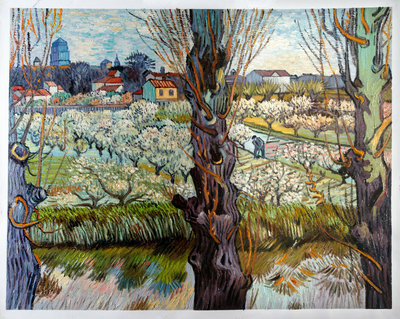 Orchard in Blossom with View of Arles was made by Van Gogh in the spring of 1889. The painting gives a clear view of the canal with Notre-Dame-le-major and Saint-Trophime to the left and a recent casern housing building to the right. This painting was done by Van Gogh when he had just arrived in Arles and he was fascinated by how the trees changed just around spring. 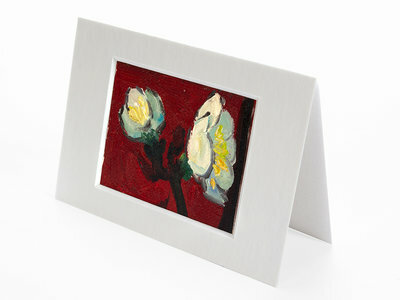 The Van Gogh Studio produces oil reproductions by the famous artist so that everyone can own a Van Gogh painting. 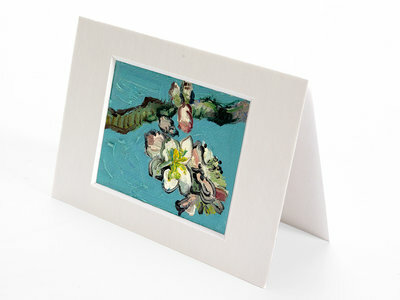 We work with talented artists from Holland and the rest of the world who have studied Van Gogh’s techniques for years. 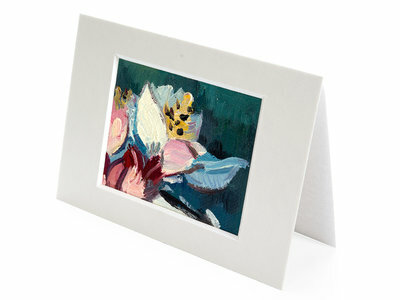 The oil reproductions you get will look and feel just like the originals hanging in the museums. But in the rarest of the case, if you aren’t happy with the painting, you can take advantage of our 100% money back guarantee.